This is the manual typewriter that recalls the thoughtful, well-written correspondence of yesteryear. Devoid of technological crutches such as spell-check and deletion, each of its 44 keys requires a firm, purposeful stroke for a steady click-clacking cadence that encourages the patient, considered sentiment of a wordsmith who thinks before writing. Using a 10-characters-per-inch Pica 87 font, it faithfully reproduces the eclectic printed impressions of its forebears–variable kerning, subtly ghosted letters, and nuanced baseline shifts–imparting unique, personal character to every letter, piece of prose, or verse of poetry. Postscript: Though it is impressive that someone is manufacturing a manual typewriter, Richard P at the Writing Ball notes its performance is unfortunately disappointing. 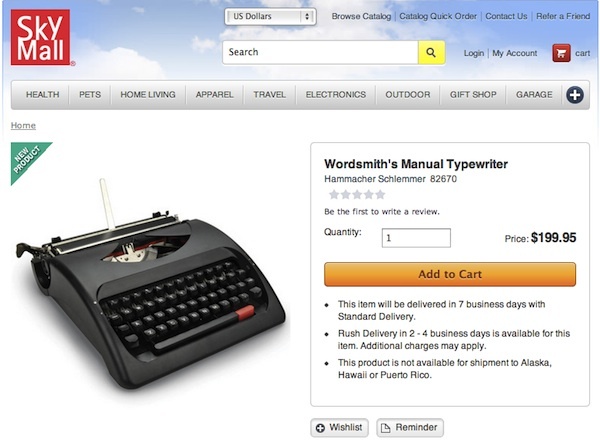 Yet another postscript: By the way, $199 for a manual typewriter?! Ah, if only the typewriter worked as well as it looks. Here’s my review of it. I read your review. Yes, if only! Judging from your photos, it appears even my 1921 Remington portable would type better than the SkyMall offering!